We only stayed in Madrid for one night since we had previously visited the city when we toured southern Spain. We met an old friend Nell Cant from our Ann Arbor days (she was the previous instructor in the course at Salamanca) and went out for tapas in an area of Madrid supposedly famous for them. Oddly we had also run into Nell unexpectedly on our last trip to Madrid in a cafe. The University of Salamanca is the oldest and most prestigious university in Spain and one of the oldest in Europe. 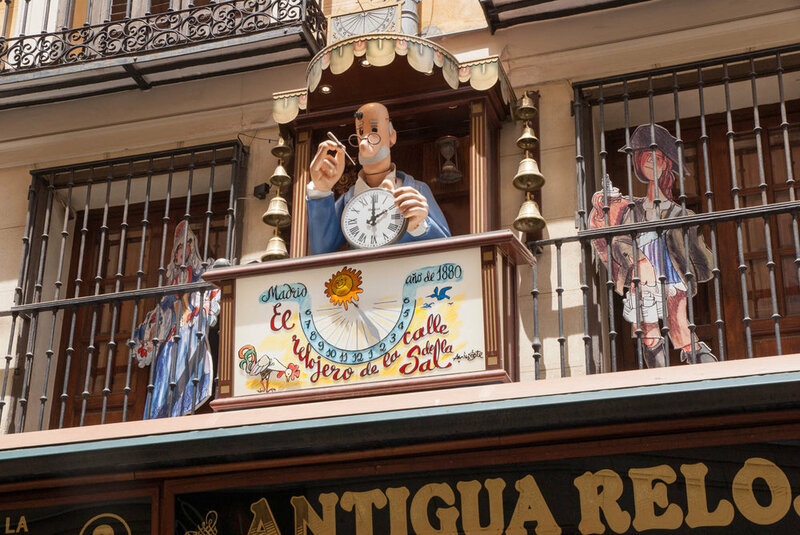 The town is very pleasant and is famous for a large and lively Plaza Mayor which is a great place to relax and have a cerveza. I spent most of my time jn Salamanca in class while Lil and Laura explored the city. 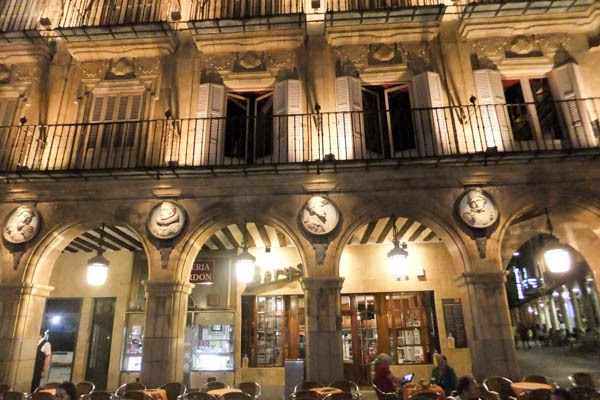 In the afternoon and evening though we sampled all of the tapas bars in the area with the help our host, Doug Oliver, and the students in the class. 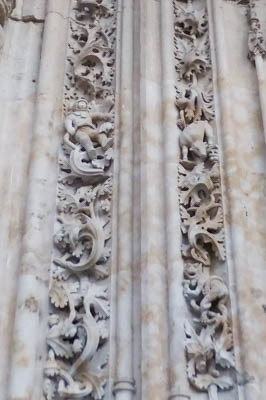 Detail of the facade around the door to the left with an astronaut with moon boots. The figure was added in a restoration in 1992. 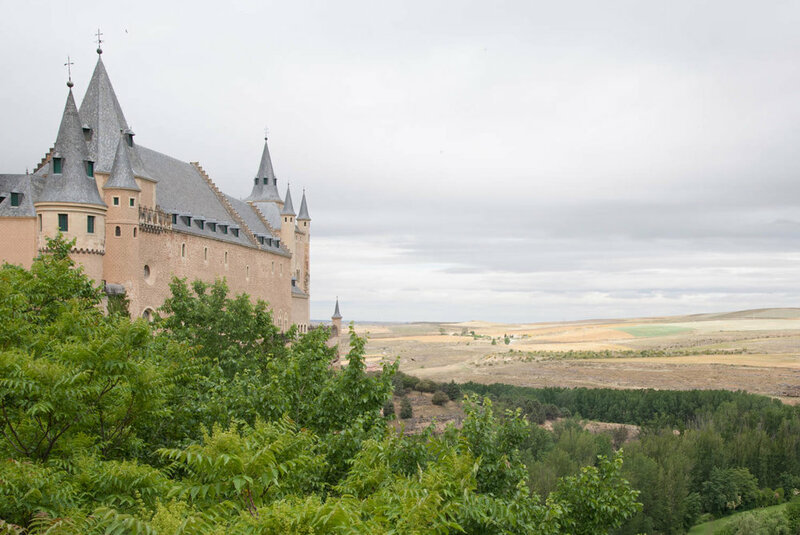 We drove to Segovia after my teaching in Salamanca was finished. On the way we stopped to take some pictures of the walled city of Avila. 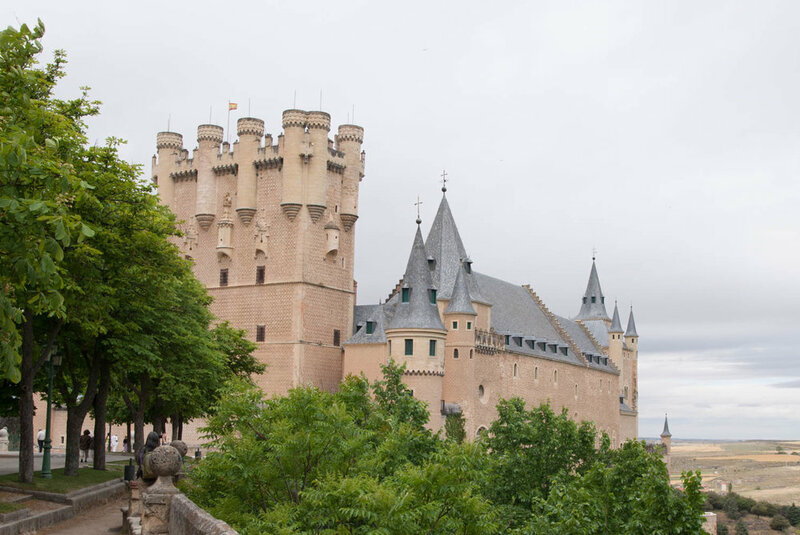 Segovia is famous for the Alcazar (or fortress) and for a well preserved and large old Roman Aqueduct that runs through the city. The cuisine of Segovia is famous for roast suckling pig. By tradition the dish is brought to the table and the pig is cut by using a dish, rather than a knife, to show how tender it is. Having the specialty of Segovia, roast suckling pig. Note that the waiter is about to cut the pig with a dish. Our next stop was Burgos which is well known for a large and beautiful cathedral. It is commonly said of our next destination, Santillana del Mar, that there are three falsehoods in the name: it is not holy (Santi), nor flat (llana), nor on the sea (del Mar). Nonetheless it is a very pretty city, but our main reason for coming here was to see the paleolithic cave drawings of Altamira, which is close to Santillana. Unfortunately they now do not allow people to enter the caves for fear of damage from the carbon dioxide and water vapor of large number of tourists. There is now a nice museum in which they built a replica of the cave with copies of the cave art. Just the month that we were there, a publication came out in Science that dated the cave drawings in Altamira to over 36,000 years ago using a new technique for carbon dating. They did not allow photos in the museum when we were there so the images of the rock art are from coasters that we bought at the gift shop. The Altamira caves are a UNESCO World Heritage site. Bilboa is now best known for the sleek and modern Art Museum designed by Frank Gehry. The museum dominates the riverfront. The small town of Hodaribbia lies nearly on the French border. On the day we were visiting they were having a medieval festival which gave the historic and picturesque town a special flavor. Many people were dressed in period costume and there were many booths set up to demonstrate and sell unique items. The medieval town of Sos is a quiet and uncrowded gem. We stayed here for two nights and had fun wandering and climbing its narrow alleys. On the way out of Sos, we were driving along and I saw a sign with an arrow and with the words “Ramon y Cajal”. For those of you who are not neuroscientists this may not mean much, but he is widely considered to be the ‘father’ of modern neuroscience. Of course I knew he was Spanish but I didn’t know where he was from. So we drove down the small two lane road that kept getting narrower and narrower. It finally dead ended in a tiny hill town called Petilla de Aragon which it turns out is Cajal’s birthplace. They have preserved the house that he was born and lived in. Unfortunately we were not there on a weekend, which is the only time that the house is open for visitors. We asked around to see if someone could let us in but to no avail. Cajal won the Nobel Prize in 1906, sharing it with his biggest rival Camillo Golgi. It is truly remarkable that he could achieve so much coming from such a tiny village, so small that the only road in deadends on the town. The next stop was a small mountain town in the Spanish Pyrenees near the French border. Before going to Barcelona we made a side trip to Tarragona which has a famous old Roman amphitheater. Barcelona is the second largest city in Spain and one of the most popular tourist destinations. We spent most of our time on an architecture tour, visiting the famous buildings designed by the architect Gaudi. 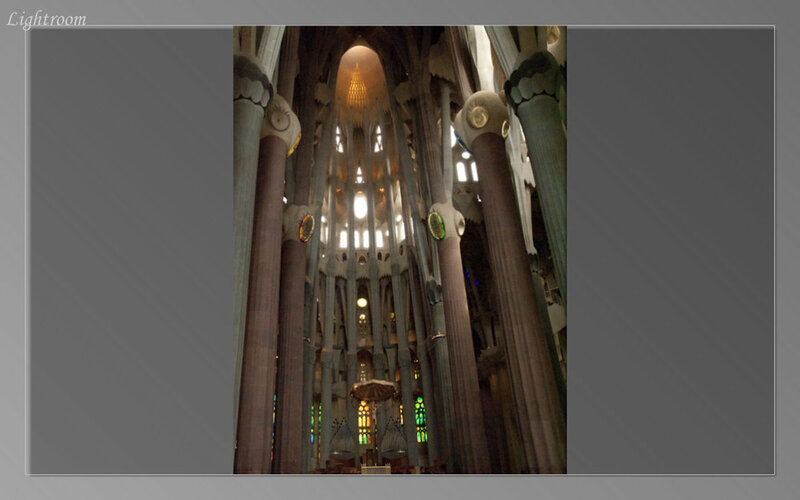 The most famous of these is the reknown cathedral known as the Sagrada Familia, which is still not finished. On the drive back to Madrid to catch our flight home, we stayed for one night in Siguenze, a moderately sized town famous for an old cathedral and an old fort.